After 4 decades at his potter’s wheel, Ted Secombe says that making pots is more challenging now than when he first began, as his motivation is purely the expression of his ideas and creativity. He has now developed a mastery of the medium that allows him to take his experimentation further than ever before. While the grace and form of the pots is impressive, the glazes Ted uses are rich in colour, and delicate in texture and patterning. Ted and his wife Ann live in a beautiful part of the Yarra Valley at Dixons Creek in Victoria, where they have an accommodation studio and a gallery for viewing his completed works. 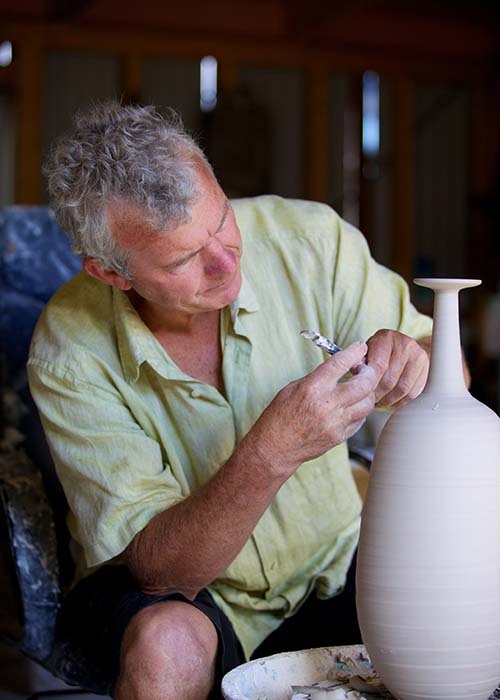 You can visit his gallery and workshop by appointment or when he is participating in Yarra Valley Open Studios. Ted Secombe’s work has been exhibited throughout Australia and in Sendai, Morioka and Sapporo in Japan. In 2001 he was invited to show a selection of pots in an exhibition of the world’s ten top crystalline glaze technologists, in Leewarden, Holland, and his pots received great acclaim. Again in 2014 in Delhi, India. Ted’s work is in many public and private collections, and he has received commissions to produce large ceramic works for corporations and hotels in Australia, Singapore, Kuala Lumpur, Abu Dhabi, Hong Kong and Shanghai. Crystalline glazes are among the most fascinating in the ceramic world. A crystalline glaze is characterised by clusters of various shapes and colours embedded into an otherwise uniform glaze of zinc or barium. This unpredictable process requires a slow cooling for the development of the crystals and a great deal of skill from the artist. Through his persistence with the technique, Ted Secombe has become one of world’s finest practitioners. One can both see as well as feel the structure of the crystals on the surface of his vessels. Crystalline is expensive to produce. It is labour intensive, demanding great skill and precise control of materials and processes. It is one of the most challenging techniques a potter can undertake. Metallic oxides and combinations of various materials are used to produce a wide range of colours. These range from dark cobalt blues through to golds, browns, reds, pinks, pearls and greens. Crystalline glazes require careful application and are fired to temperatures of 1320 C for up to 18 hours. The glaze becomes very fluid at high temperatures and has the tendency to flow from the surface of the pot. Ted has over the years learned to control this glaze fluidity so each piece has a consistent cover of crystals. Once the high temperature has been reached, the kiln is rapidly cooled to lower temperatures where the crystals form. As crystal formation requires slow cooling, temperatures are precisely controlled and manipulated for maximum crystal growth within the glaze. Crystals are formed at random, can take on a myriad of shapes and are three dimensional in nature. The beauty, depth and life expressed in a Crystalline glaze is spectacular and unsurpassed. It is a challenge to even the most experienced and knowledgeable potter.